Thanks to the generosity of a fellow officer in my dorm’s government, enjoyed free tickets to The Producers. Loved it. Much funnier than the 2005 film version (or even the original Mel Brooks movie), the play is a brilliant combination of physical, situational, political, and general humor. No wonder it’s the most award winning play in history. 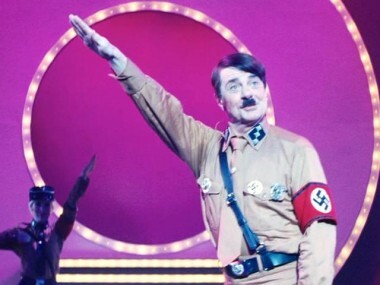 Yet Mel Brooks’ vicious, satirical attack on the Nazi Party and German ultranationalism was not condemned by Nebraska’s sizeable German community. The reason is obvious: American Germans do not see Nazis as part of their community, American Germans are not sympathetic to Nazi Party ideals or methods, and very few American Germans would view the American government as partially or largely at fault for World War II. American Germans do not “respect” Nazis and Americans do not “respect” the Nazi Party. Long Island University has fired five students from their positions as resident assistants at the C.W. post campus after they posted a fake hostage video on the Internet with the pretend hostage takers speaking in Middle Eastern accents. In the video, five figures in ski masks speak in crude Middle Eastern accents as they threaten a ‘captive’ â€” a rubber duck named ‘Pete’ that serves as the mascot of a residence hall at the campus, Newsday first reported. The video was posted on the Web sites Google and YouTube, but it has since been removed, according to the newspaper. 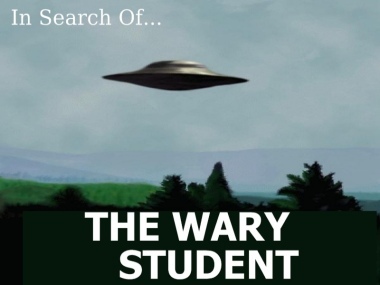 A search of those two sites on Thursday also failed to recover the video, which Shenker said was reported by residence life staff to administrators on Jan. 30. Previously on Islam withoout Irony… The Case of Robert Redeker. 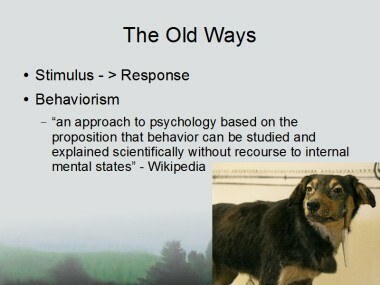 Scientific psychology began with behaviorism, an attempt to explain all responses in terms of stimuli. 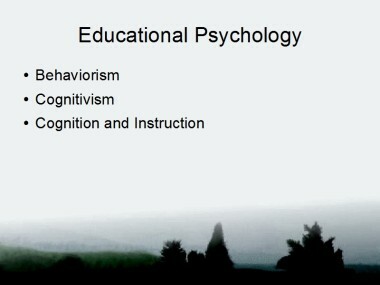 Cognitivism broadened the realm of scientific endevour by theorizing mental states that can be systematically examined. 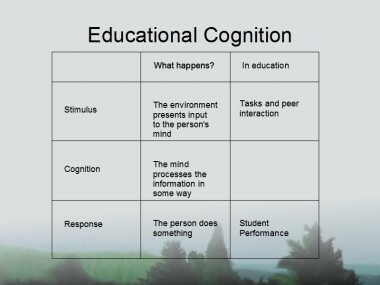 From this comes modern educational psychology, which attempts to apply cognitivism to educational settings. 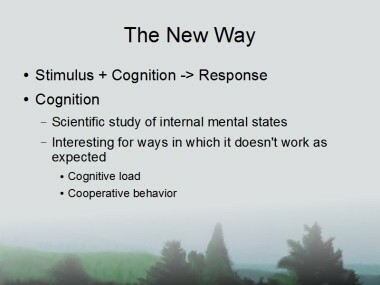 Beharioism was mindless, in that it rejected the notion of a “mind.” Starting from the reasonable hypothesis that all variation in dependent variables are explained by indepenent variables, the behaviorists rejected mental states are either controlled or controlling factors. Pavlov’s experiments with his dogs, where salivation was explained in terms of bells, is the defining exmplar of this paradigm. Nowadays, though, the mind is considered important, and it is explored as if it were an unknown computer. The computer’s limitations are the most interesting things about it. Limited capacity theory is a building-block of information-processing psychology (Lord & Maher, 1990). From Miller (1956)’s â€œseven, plus or minus two â€œ to today’s theory of cognitive load (Sweller, 1988) and its evolutionary study (Sweller, 2006), the realization that students have limited mental capacity allows educators to teach more efficiently and more effectively. 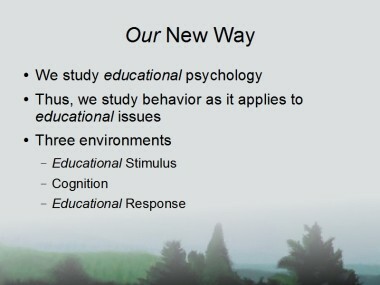 Educational psychologists study behavior because of its impact on performance. Behavior, like intelligence, strongly predicts school performance, and behavior is more amenable to modification than intelligence, at least among elementary scholars (Harper, Guidubaldi, & Kehle, 1978). Similarly, continued and intense practice (behavior) in an area has a great deal of influence on developing expertise (Weisberg, 1993; Kiewra, 1994; Csikszentmihalyi, 1996) â€“ more so than even raw power (intelligence) in that field (Gardner, 1998). Studying behaviors, such as how one copies-and-pastes (Igo, Bruning, McCrudden, & Kauffman, 2003; Igo, Bruning, & McCrudden, 2005a; 2005b) and how one takes notes (Titsworth & Kiewra, 2004; Brenton, Kiewra, Whitfil, & Dennison, 1993), changes comprehension. PS: In the link about to Origins, I was going to link it to shelfari instead of Amazon, but I can’t recall my password. If you’re tired of managing Web 2.0 identities, be sure to check out “Useless Account” (tagline: Better than Twitter).